According to premier researcher Don Braben, these are the vital intellectual processes that underlie all human achievement, the kinds of risk-taking activities that have made our civilization what it is today. Yet, warns Braben, the same pioneer spirit that fueled our meteoric industrial and scientific growth is now being undermined by a growing climate of corporate caution and conformity. In this groundbreaking manifesto on the importance of scientific freedom, Braben asserts that the greatest long-term risks facing humanity will not come from weapons of mass destruction, prolonged global war, devastating disease or famine, or even from extinction by a huge wayward meteor. Rather they will come from the debilitating attrition caused by the rising tides of bureaucracy and control that are steadily strangling human ingenuity and undermining our future. Addressing this serious and growing problem, Pioneering Research: A Risk Worth Taking explains the urgent need to maintain both the originality and freedom of expression that is so vital to our economic growth and scientific development. Citing global trends and attitudes that currently threaten these conditions, Braben details some bold new initiatives that may offer a possible solution. A compelling read for today's scientists, policy makers, and concerned laypeople, Braben's book will change our understanding of the politics of scientific achievement and expose the threat to our future from bureaucracy, paper trails, political correctness, lowest common denominator solutions, and accountability-the invisible chains that bind the imagination and damage our society irreparably. DONALD W. BRABEN, PhD, is Chairman and Chief Executive of Venture Research International Ltd., and visiting professor at University College, London. 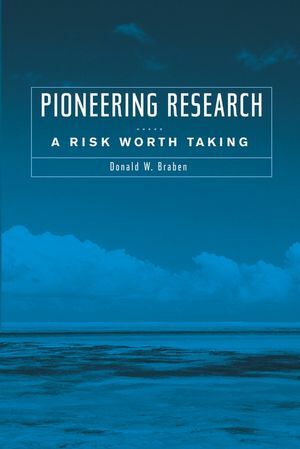 With more than forty years of experience in the field of nuclear structure and high-energy physics research, Dr. Braben headed up the Venture Research Unit, a distinguished research initiative that concentrated on radical, exploratory, basic research and led to several profitable industrial opportunities. He is also the author of To Be a Scientist.